I think this is the last in my Kaisercraft Blubelle series, and here Is a similar card and box to last night one – using a julie Nutting Prima doll stamp,and the blubelle papers.the background papers are from the 6′ pad,and I mixed in a few of the matching collectables.The flowers on the card on the left are prima and kaisercraft, and I die cut the one on the box using my stampin up blossom party die.i have spent a productive day in the craft room, playing with some new kaisercraft storyteller papers which i wil get nathan to photo this weekend, and hopefully will be able to show next week! til tomorrow…. Kaisercraft blubelle number 5, prima doll stamp. 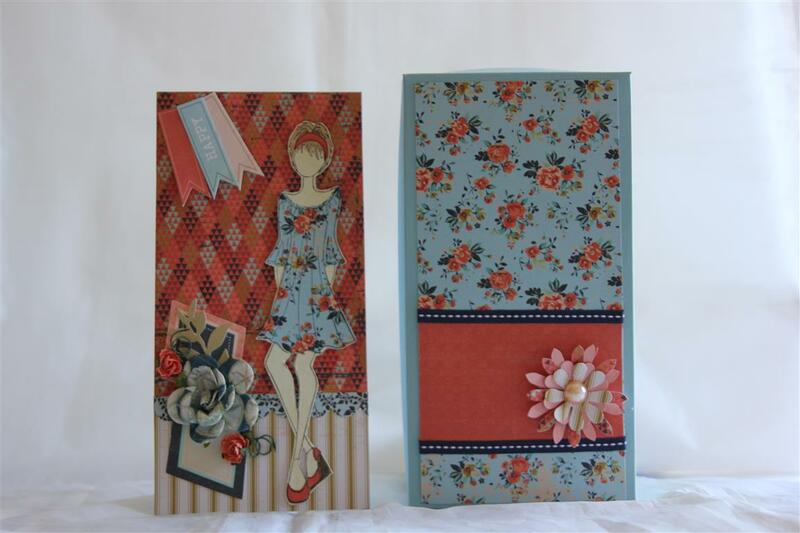 kaisercraft blubelle 12 x 12 paper, 6″ paper pad, and matching collectables.On the left is the card – I stamped a Prima Julie Nutting stamp onto some neutral paper, and cut out, and again onto patterned paper, and cut out the dress and put her back together.I added some collectable banners in the right hand corner with some ribbon,and added kaisercraft flowers in the lower right hand corner.On the right is the box, which I kept simple, making a flower using my stampin up blossom party die.the cardstock used is stampin up. I was missing yesterday as I haven’t been well – I am suffering from a cold, and feeling more than sorry for myself! Luckily the lemon tree has lots of fruit on it so I have been drinking lemon and honey drinks and that does seem to help a bit.Til tomorrow…. Quick post tonight as I am struggling a bit today – my son gave me his cold for Mothers day! 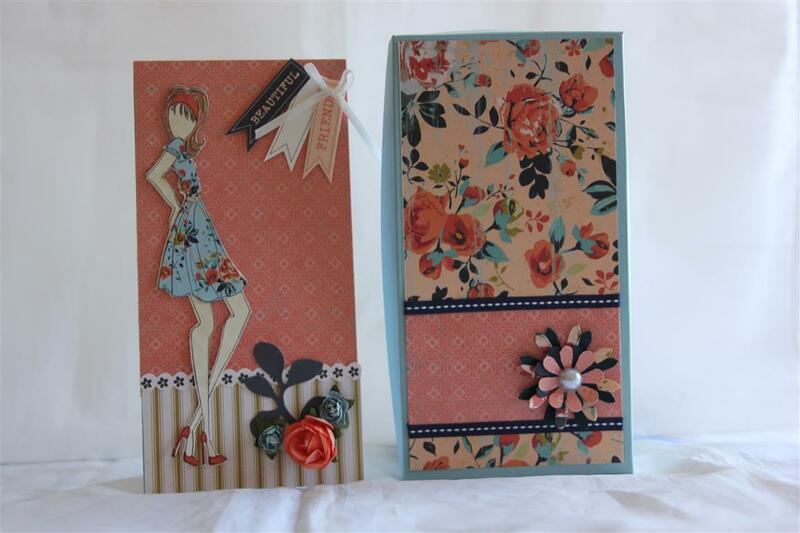 today is a card and matching box ( box on right) made with Kaisercraft Blubelle papers, and a couple of the matching collectables. 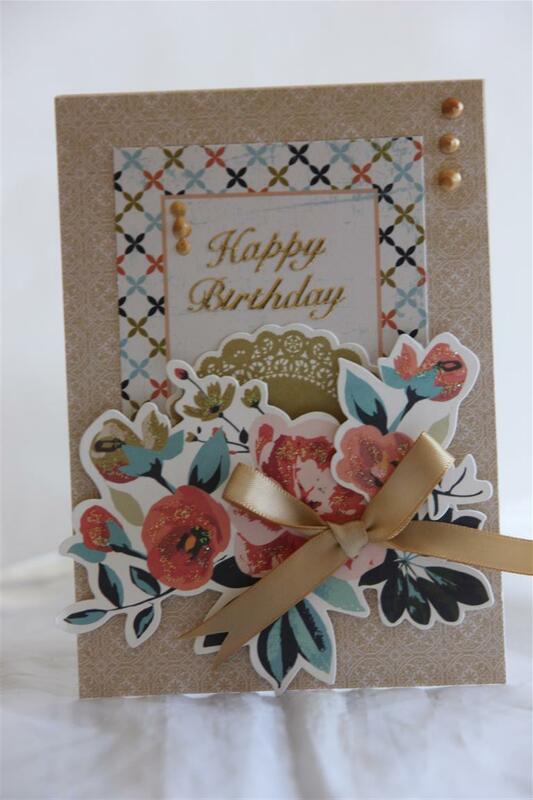 I like the background paper I have used on this one.I cut one of the doily collectables in half and used it on opposite sides of the main element of the card. The flowers are kaisercraft mini flowers, and I also used some lace, satin and organza ribbon and a pearl.I kept the lid of the box quite plain.Til tomorrow…. 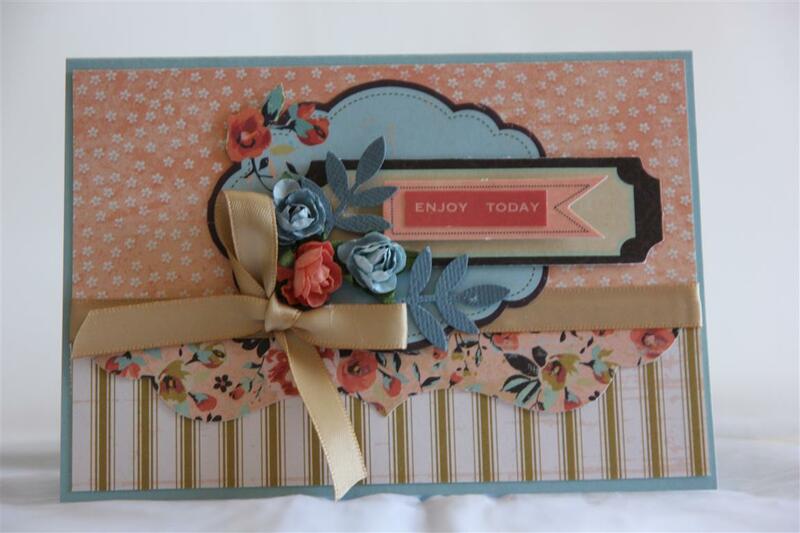 This one is Kaisercraft Blubelle paper pad, and matching collectables.I also used Kaisercraft mini flowers, and my martha stewart leaf punch ( in my world leaves don’t have to be green!) 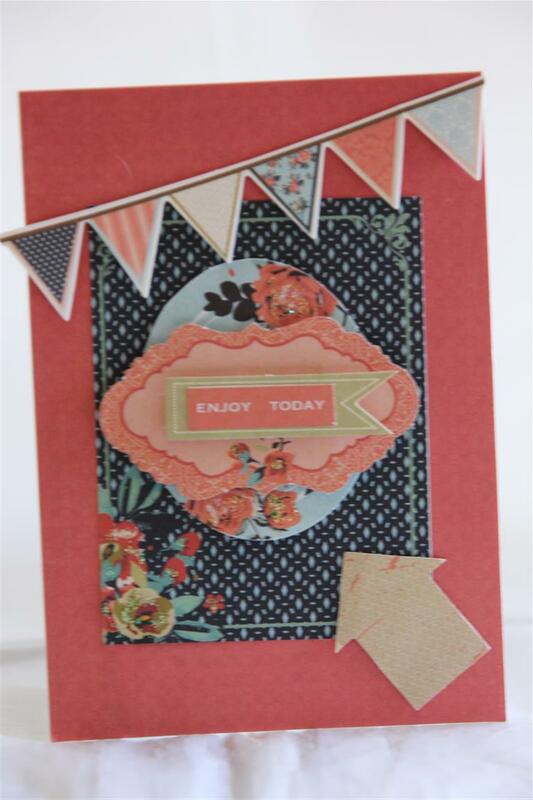 and some lovely satin ribbon, and stampin up cardstock.I hope you have all enjoyed Mothers day today, til tomorrow…. 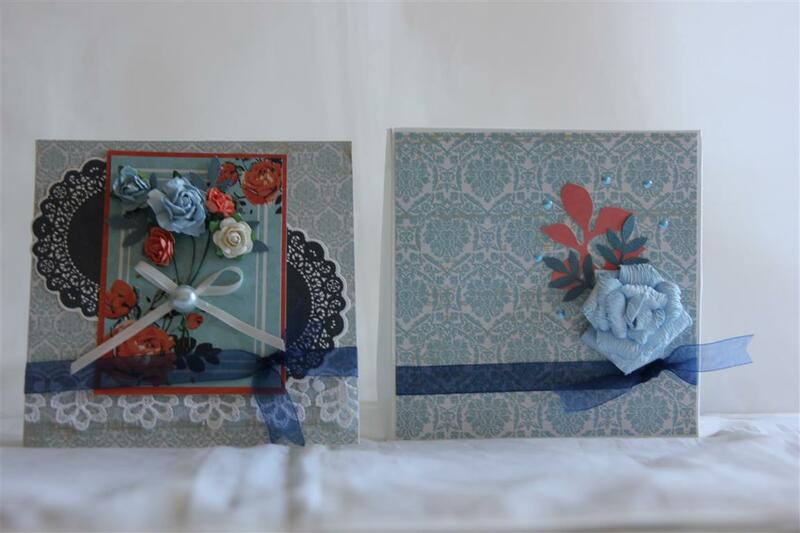 A new range today – kaisercraft Blubelle, here some of the 6″ pad, a piece from a 12 x 12 paper and the matching collectables.Totally different colours to the last range I was showing – but that is what makes card making fun! always different! I have been playing with some new tools today, the new we are memory keeper flower punch board in particaular,The flowers it makes are rather big, and probably not too good for cards, but i have a lovely vase of paper flowers sitting on the dining table now!